Litmus's VP of Marketing Justine Jordan is one of my favorite people on the planet. There are few out there who bring the level of depth and passion to a product and ecosystem as Justine does for email (and cat GIFs). Yes, email - which Justine unpacks in her SaaSFest talk as a medium we think is boring or "so 1999", but we forget is consistently the highest ROI tool in our toolkit. In her talk Justine blasts through over 40 tips on how to improve your email marketing, while also laying the groundwork for how you should be thinking about your email marketing strategy as a whole. I highly recommend you watch her entire talk (or at least have whomever handles your email watch the talk), because there's no use in having an email list, if you're making these costly mistakes. If you don't have time to watch, I've put together the couple of big concepts and takeaways below, including the framework you should use to approach email, as well as the tactical pieces you shouldn't overlook when it comes to the functional pieces of your email sends. As Justine put so well, "when we only send emails that benefit our business, we completely lose our brand trust." After all, when building a brand (and to a greater extent a business), it's all about building a relationship with your customer (the subscriber in this case). To ensure that relationship is on the right foundation Justine suggests that, "you have to combine the needs of your business and the needs of your subscriber." 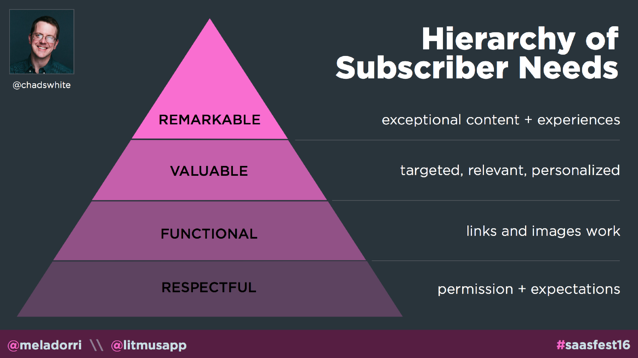 The best framework to ensure you're covering your bases is by using Litmus's Heirarchy of Subscriber Needs. The base of the hierarchy really focuses on the functional and legal aspects of sending emails. Do you have permission to send emails to the subscriber according to the spam laws of the country the subscriber inhabits? Have you set expectations with the subscriber on how often you'll email? Do the images load? Do the links work? These foundational pieces may seem obvious, but you'd be surprised at how many marketers fall prey to myths around email's function and permissions. Heading up to the peak of the framework, we get into making sure our content is exceptional and valuable to the subscribers time. 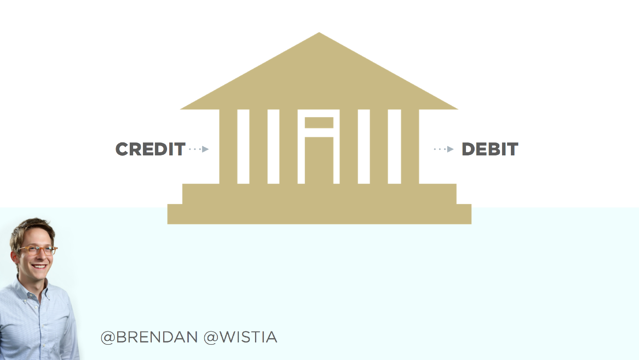 At this point, we get into aspects of sending a communication that can really impact the debits and credits of what Justine (via Brendan Schwartz from Wistia) calls the trust bank. Every time you send an extremely relevant, high quality email that checks all the heirarchy's boxes, you get more trust banked from your users. Every time you send something overtly self-serving or with broken links, you lose trust. Beyond the foundations of a good email strategy, Justine's talk was full of immensely useful tactics and quick wins, particularly when it came to some of the "boring" bits of sending email. One particularly insightful point was that 30% of people are going to see your actual email (if you're lucky), but 100% of people will see your subject line, from name, etc. Seems obvious, but as Justine mentioned, most marketers spend so much time on the email and then wait until the last minute to figure out the subject line. "Maybe 20-30% of people open your email, but 100% see your subject line"
A similar area ripe for opportunity is the email from name, because this is the first piece thing people look at in determining if they're going to open your email. 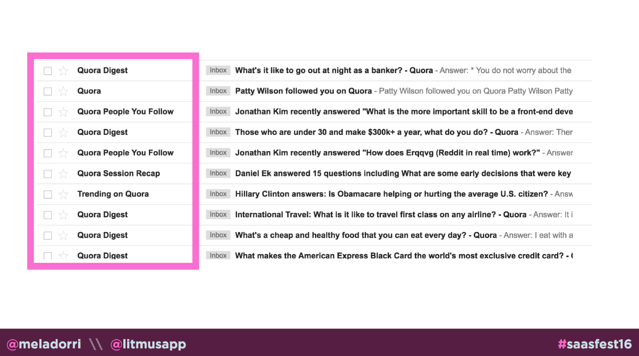 A great case study/example of taking advantage of this behavior is Quora. They actually use the from name to preview the type of content they're sending to set expectations for the subscriber on what they're going to see when they open the email. 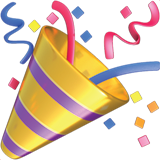 Big takeaway #3: Email is an invitation, the landing page is the party. You're sending an email to get a conversion of some sort, but often times we as marketers make it incredibly difficult to get subscribers to the party. Justine suggests really thinking through your subscriber's experience, and make modifications accordingly. For instance, if your subscribers rarely have images enabled, then you need to have really good text based emails. Similarly, if your subscribers are all on mobile, then make sure you're mobile optimized. We live in a world where the technology and knowledge around emails is advanced enough that there really isn't an excuse anymore for messing up the basics. Further, size matters. 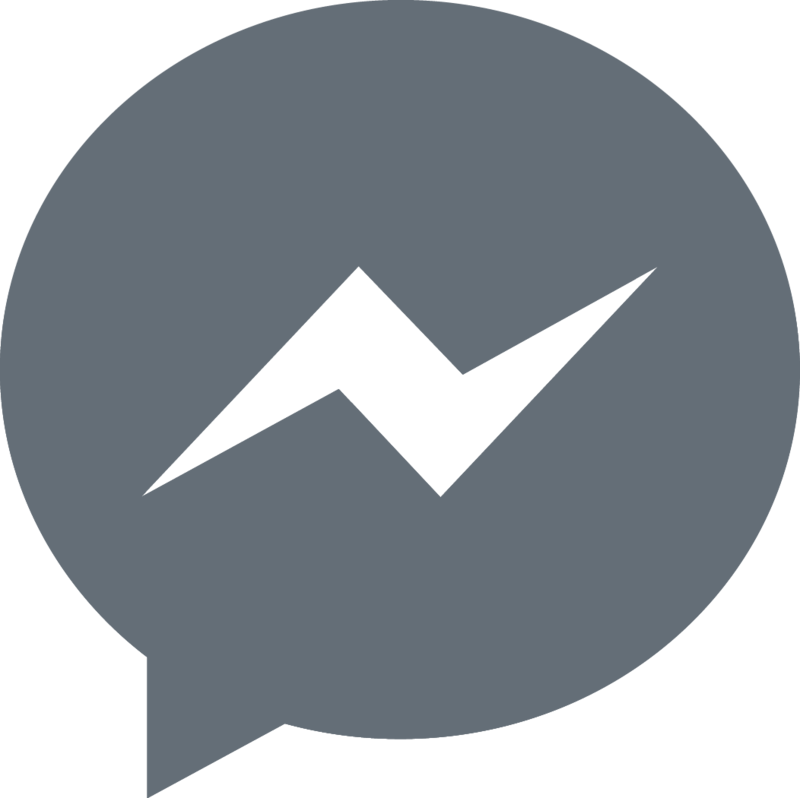 In a mobile world, you don't want to leave your users pounding their phones trying to click through on your emails. We should enlarge all the things. 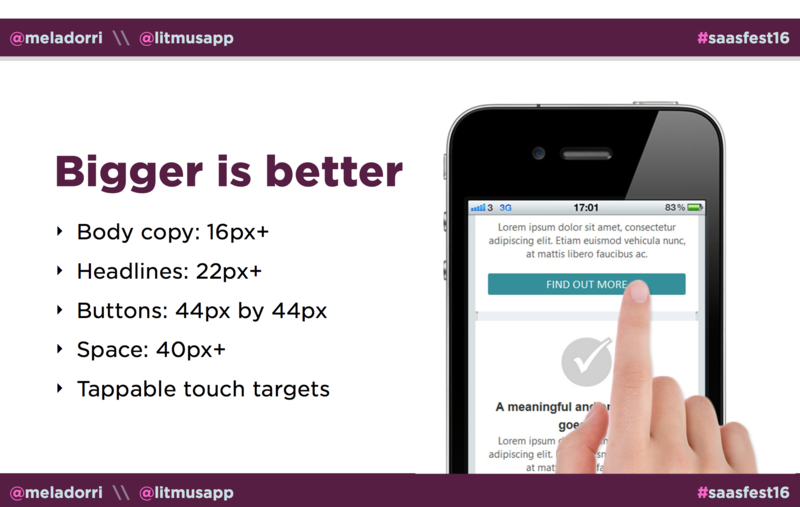 Body copy should be 16px or larger; headlines should be 22px+; and buttons should be a minimum of 44px (this is the size of the average thumb according to Apple). There's no way I was going to be able to get through all the knowledge Justine dropped on the SaaSFest stage, but hopefully the above three concepts helped. I really reccommend you check out the full recording, or at least walk through the slides below. After all, there are a lot of pieces of gold in your email list - but you need to make sure you effectively extract them while building a stellar relationship with your subscribers.